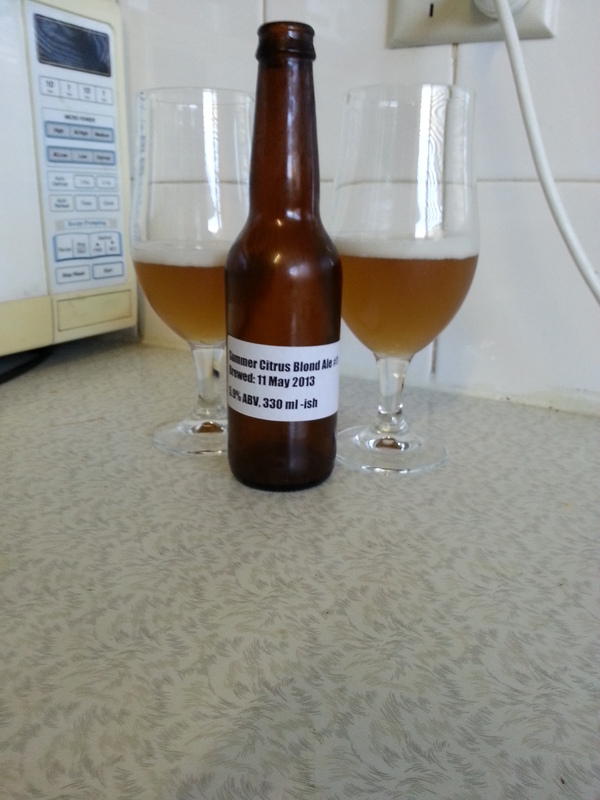 So the Summer Citrus Blonde Ale that we made a few weeks ago is done! Once again, this one was from the guys at BrewSmith. This beer was ready to drink pretty quickly. Being a blonde, it was OK to drink without letting it condition for too long, although leaving it the bottle for awhile probably wouldn’t hurt it either. It was a lovely light beer, so conditioning it longer wouldn’t have been of much benefit anyway. First impressions on the aroma were great, albeit subdued. The main thing that came out in the smell was citrus with a little bit of alcohol; although it’s possible my nose got a little confused and it was just the citrus. Hunting for it, there was a bit of a smell of malt, but more of a lager smell than anything (although this beer was an ale). Going further, there was the slightest hint of caramel, probably still from the malt. As I mentioned, it was very light in feel, although not thin at all. There was a good amount of body to it. The citrus, which was dominant but not overpowering, gave everything a crispness that made the beer refreshing and not heavy at all. Although lemon zest was used to give these flavours, it was definitively a general citrus feel rather than just lemon. The citrus really cleared my head with every sip, making it extremely refreshing. I was surprised at how much the coriander came through as well. I was also surprised that I enjoyed the coriander! Although the beer was not overly hopped, there was a slight amount of bitterness that interacted well with the citrus. The hops gave no fruit or spice. Some fruit would have been welcome (although not needed), although spice would have been inappropriate. Being such a light beer, I’m sure this would be highly sessionable. I didn’t get the alcohol content from Mikey, but maybe he’ll enlighten us in the comments. I suppose the only problem I had with my tasting was that it was done during one of the coldest weeks we’ve had in Melbourne so far this year! Having one (or five!) of these on a hot summer’s day would be no problem at all. If I would change anything at all, I would probably add a little more bitterness to further compliment the citrus. That, or a little more fruit in the aroma would serve the beer well. As for food, a light BBQ (chicken perhaps) would be great, or something with a bit of spice. The main thing I’d recommend though is steamed crab, especially with ample amounts of Old Bay seasoning. That would be the way! P.S. I also had one of the malted ciders I made awhile ago. It turned out great! My house mate went crazy for it and stole the whole glass when I offered her a taste of what would have been my second bottle… I’ll give one to Mikey to do a proper review of later. Finally getting around to sitting down and having one of these brews. Chas is on the money with the review. Chrisp, zesty and light, but still a good body. The coriander does come though quite a bit from the middle to the end. Will be a really good beer for summer. Pitty it’s the middle of winter. I even agree with Chas on the food to match. Light BBQ white meat would be good. I think a Cajun chicken would be a great match. Cajun chicken! That’s perfect! I still maintain Maryland style blue crab would be best, but yes, cajun chicken too.